Sitting in church listening to the story of Pentecost from Acts 2 this week, I was struck by the disruptive power of the Spirit. The disciples were gathered together, just as we were in church, and were interrupted when their house was filled with wind and fire so strong that crowds gathered to see what's going on. The interruption drove the disciples out, to speak to the crowds of their faith in Jesus Christ. What an interruption! Perhaps, I thought, we could do with a little disruption like that. The Spirit at Pentecost launches the mission of the church, in fulfilment of Jesus’ commission to the disciples to proclaim the good news to all creation. Wait a minute: haven't I got that wrong? Doesn’t Jesus talk about proclaiming the good news to all people? At the end of Matthew's gospel, Jesus tells his disciples to make disciples of all nations (Matt. 28.19). But the ending of Mark's gospel puts it differently: 'And he said to them, "Go into all the world and proclaim the good news to all creation"' (Mk 16.15). Perhaps this reference to all creation is just overstating for effect: perhaps the first readers saw "creation" and understood "people". But elsewhere in Mark (10.6, 13.19) and elsewhere in the New Testament (e.g. Rom. 8.19–22) the word for creation doesn't have that narrower meaning. And Paul's letter to the Colossians shares Mark's wording, stating that the gospel "has been proclaimed to every creature under heaven" (Col. 1.23). So perhaps we should take the possibility seriously that the mission of the church, inaugurated at Pentecost, relates to more than the human realm. Perhaps this Pentecost, we should think of what it might mean for the church to bring good news to all creation. What might that look like? Well, one biblical example of this is the story of Nineveh’s repentance in response to Jonah's preaching, where, comically, not only humans but also the animals abstain from food and water, dress in sackcloth, turn from their evil ways, and cry mightily to their God (Jon. 3.7–8). Or we could recollect the story of St Francis’s preaching to the birds, in which he explains to them why they are obliged to sing praise in all times and places in gratitude to God. Francis proclaims to the birds that it is God, their Creator, who brought safely in the ark with Noah. It is God who gives them liberty given to fly to all places, provides clothing for them so they do not need to spin or sew, and provides them with food so they do not need to sow or reap. God gives them "fountains and rivers to quench your thirst, mountains and valleys in which to take refuge, and trees in which to build your nests". Less well-known is the story of St Anthony of Padua, a follower of Francis who tries to convert the heretics in Rimini to Christ. When they refuse to listen, Anthony turns to the shore, where a river runs into the sea, and preaches to the fish instead. Fish in the river and the sea approach the bank, keeping their heads out of the water, and arrange themselves in rows, with the smallest at the front and the larger in the deeper water at the back. Anthony preaches to them of their obligation to praise God, for giving them such a noble element to live in, allowing them choice between salt and fresh water, providing many places of refuge from storms, preserving them in the flood when all others drowned, giving them fins to go where they wish, giving them the privilege of keeping Jonah safe and giving tribute money to Christ, and nourishing him before and after his resurrection. The fish all bow in reverence praise. The people watching are so touched by the miracle that they convert, and fish swim away, rejoicing. These stories are fascinating, but perhaps take the proclaiming of good news to all creation a little too literally to be useful to us. Perhaps we would be better off understanding bringing good news in a wider sense. In another story of St Francis, instead of preaching to the birds, he acts to release them from captivity and death. On meeting a young man who had trapped a large number of doves, Francis entreats the man to give them to him "so that they may not fall into cruel hands, which would put them to death." The young man is inspired by God to do so, and Francis embraces them, and makes nests for them. The birds lay and hatch eggs in the presence of the friars and the young man becomes a friar. This is definitely a story of good news for the doves! It is not hard to make a connection between Francis acting to free the doves and examples of animals kept in captivity today. 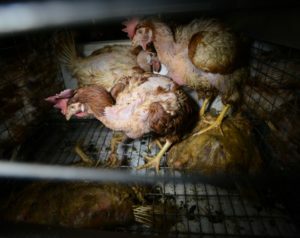 What if Francis had been confronted with a modern windowless broiler shed in which chickens were being raised for slaughter after 35 days in close confinement, or by chickens kept in cages for eggs, or pigs raised intensively in conditions so crowded and monotonous that their tails must be docked to reduce their injuries to one another? In Francis's vision of God's love for animal creatures, disciples share the good news of the gospel with animals by releasing them from human cruelty and death. Perhaps we need to consider how the church today could create new stories that good news for animals, by helping to ensure fewer of them are raised in these conditions. Farmed animals are not the only creatures of God in need of good news, of course. Bringing good news to creation must include action to reduce the harms we are visiting on human and non-human creatures through our greenhouse gas emissions, and our pollution of the environment we share, and the mass extinction of non-human creatures our encroachment on their environment is causing. But a recent paper by academics at the University of Oxford confirms that reducing meat consumption would have benefits in all these areas, as well as benefitting human food and water security, and human health. Here's one thought. The CreatureKind Commitment affirms God's care for all creation, and proposes that Christians reduce their consumption of animal products and attend carefully to the lives of animals used to produce the meat, dairy, and eggs that we continue to consume. That seems to us a first and necessary step towards proclaiming the gospel good news to all creation. What do you think? If you agree, please sign up to get updates on the CreatureKind project. If you can also help support the project financially, we'd be most grateful.